Image of a older man of color speaking at a podium. Join the Association of University Centers on Disabilities (AUCD) on March 19, 2019, for its annual AUCD for All Gala to celebrate Leadership in Civil Rights For our centers and programs across the country, the core civil rights vision of the ADA and other disability rights laws informs the approach we take to improving the lives of children and adults with disabilities and their families. This vision begins with the idea that disability is a natural part of the human experience, that self-determination and community integration are fundamental human rights, and that everyone should be able to participate fully in their communities and be treated with dignity and respect. We believe in high expectations for all people. We believe that the poor quality of life experienced by many Americans with disabilities is a result of discrimination and failings of our education, health care, and human services systems. 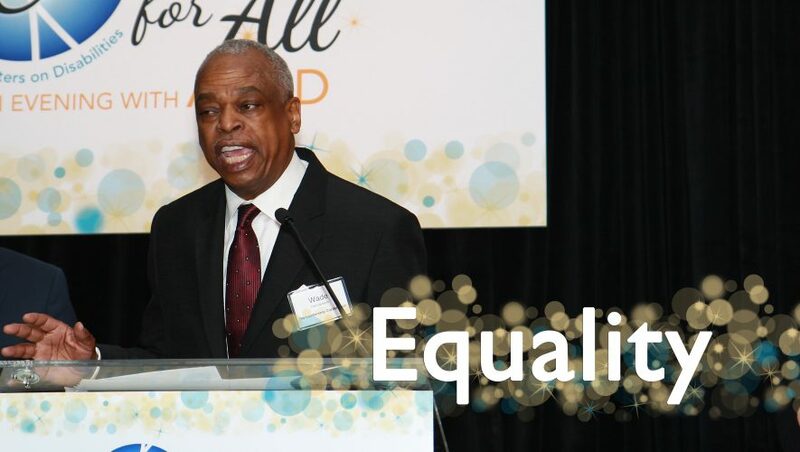 Finally, we see the connection between disability rights and other civil rights issues, and we seek to address issues of disparity and inequity that affect people with disabilities from diverse cultural backgrounds. The AUCD for All celebration brings together leaders from all sectors who are tireless advocates for disability rights, equity, and inclusion. On this night we honor those who stand up for civil rights and lead the way toward inclusion, opportunity, and social justice for all. Watch this video to learn more about AUCD.